Reprinted from the Children's Encyclopedia The Book of Knowledge, Volume 24, page 5663. Thank you Google Docs for making this available. 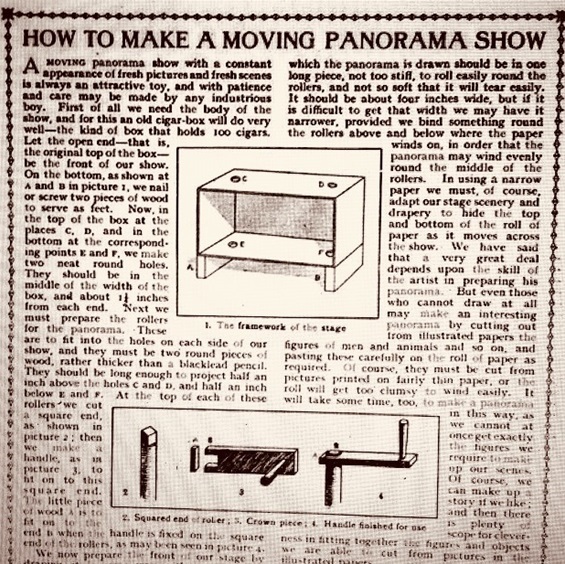 A moving panorama show with a constant appearance of fresh pictures and fresh scenes is always an attractive toy, and with patience and care may be made by any industrious boy. First of all we need the body of the show and for this an old cigar-box will do very well - the kind of box that holds 100 cigars. Let the open end-that is, the original top of the box - be the front of our show. 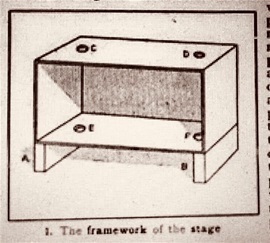 On the bottom, as A and B in the picture 1., we nail or screw two pieces of wood to serve as feet. Now, in the top of the box at the places C, D, and in the bottom at the cooresponding points E and F, we make two neat round holes. They should be in the middle of the width of the box, and about 1 1/2 inches from each end. 2. Squared end of roller. 3. Crown piece 4. Handle finished for use. Next we must prepare the rollers for the panorama. These are to fit into holes on each side of our show, and they must be two round pieces of wood, rather thicker than a blacklead pencil. They should be long enough to project half an inch above the holes C and D, and half an inch below E and F. At the top of each of these rollers we cut a square end, as shown in picture 2; then we make a handle, as in picture 3, to fit on to this square end. The little piece of wood A is to fit on to the end B when the handle is fixed on the square end of the rollers, as may been seen in picture 4. We now prepare the front of our stage by draping it in some way with curtains, and here there is plenty of scope for artistic taste. 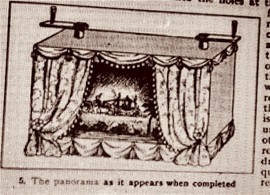 The width of panorama showing at one time should be about four inches in the middle of the show, so that we drape the sides accordingly, taking care that the rollers on which the panorama works, are quite hidden from the front. The drapery of the show may be in actual silk or velvet, or it may be painted on cardboard, according to our opportunities, skill, and taste. The next thing is to prepare the panorama, and here again a great deal depends upon our ability and skill in drawing and painting. We may select any subject - Robinson Crusoe, scenes from the Arabian Nights, Jack and the Bean Stalk, Cinderella, and so on; or we may like to draw a procession. 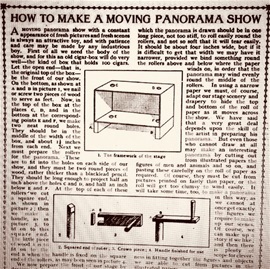 The paper on which the panorama is drawn should be in one long piece, not too stiff, to roll easily round the rollers, and not so soft that it will tear easily. It should be about four inches wide, but if it is difficult to get that width we may have it narrower, provided we bind something round the rollers above and below where the paper winds on, in order that the panorama may wind evenly round the middle of the rollers. In using a narrow paper we must, of course, adapt our stage scenery and drapery to hide the top and bottom of the roll of paper as it moves across the show. We have said that a very great deal depends upon the skill of the artist in preparing his panorama. But even those who cannot draw at all may make an interesting panorama by cutting out from illustrated papers the figures of men and animals and so on, and pasting these carefully on the roll of paper as required. Of course, they must be cut from pictures printed on fairly thin paper, or the roll will get too clumsy to wind easily. It will take some time, too, to make a panorama in this way, as we cannot at once get exactly the figures we require to make up our scenes. Of course, we can make up a story if we like; and then there is plenty of scope for cleverness in fitting together the figures and objects we are able to cut from pictures in the illustrated papers. When the roll is quite prepared, we put our roller through the holes at the top of the show and into the holes at the bottom. Then we paste one end to one roller with glue, taking care that the pictures are on the side seen through the opening of the show. When the glue is quite dry, we turn the handle and roll the paper round the roller until there is just sufficient left unrolled to glue the other end to the other roller. When this is dry, the panorama is quite completed and ready to show. We can then give an entertainment to our friends, getting our brother or some other friend to turn the rollers as we give directions, while we stand in front and tell the story of pictures as they pass across the stage. The interest of the entertainment depends on how the story is told.